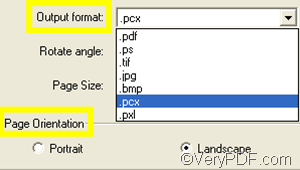 VeryPDF PCL Converter is not just a PCL converter, but also a PRN to PCX converter which supports option settings. So, when you convert PRN to PCX, you can also set page orientation, set paper size, rotate the pages, etc. This article introduces how to use VeryPDF PCL Converter to quickly convert PRN to PCX and set page orientation. Four steps are required. If you don’t have VeryPDF PCL Converter, please download and install it on your computer. Then, you can start with opening this application. Firstly, to open VeryPDF PCL Converter, please right click its icon on the desktop, and then click Open in the list that appears. The interfaces of the trial version and the registered version are slightly different: the registered one does not have the Register button under the list box. Secondly, you should input the PRN files. If the files you want to convert are distributed files, you can drag them from Windows Explorer to the list box on the interface. If you are using a folder to store all the PRN files you want to convert, you can do as follows: click File on the toolbar of the interface, > click Add Directory, > select the folder and press Enter. Thirdly, to create PCX files from the source files and set page orientation you should: click Setting on the interface, > in the pop-up dialog box, select .pcx from the Output format drop down list, > click either of the radio buttons in the Page Orientation group box. > Click OK.
Fourthly, please click Start on the interface, > in the Browse for Folder dialog box that pops up, select a folder and click OK. The compute prompts to convert the documents for you and you can check the result PCX files in a few seconds. Is there a convenient way to save EMF as JP2? How to convert many pcl files to one pdf file? How to convert a document of mht to eps file? This entry was posted in VeryPDF Blog and tagged prn to pcx, set page orientation. Bookmark the permalink.